Golfers have special feelings for their putters, certainly different than for drivers and definitely different than for wedges. However these feelings don’t stop us from owning more than one flat stick and perhaps several alternating residency between golf bag and closet. And of course any putter discussion has to include those from Ping Golf whose company name came from the sound its first model made when it struck a ball. Back in 1966, founder Karsten Solheim, created the “modern blade” putter, the iconic Anser that in one form or another Ping has been making ever since. A record for sure but the design was so good that every other putter company made their own version of it—to tell the truth, most look like flat out copies—which says volumes about how well the Anser-shape performs. So regarding this extended playing test of the Karsten TR Anser 2, after one has used a putter for 10 rounds two things become clear. Does the shape fit your eye? Some putters look great in the golf shop or even on the putting green but soon for some unfathomable reason you can’t stand the sight of them. Secondly, how does the putter hold up under pressure? Notice I said the putter not your stroke. It’s a given when trying to make that 5-footer on the last hole to win the Nassau and carryovers our stroke will be suspect—heck, even the guys on Tour get a case of the wobblies. But what about the way the putter feels and performs? Does it fit you and your stroke? To hold up under pressure the putter has to be the correct one for you so it’s important of course to be fitted for the same reasons you get a driver fitting. Right from the beginning, after a few quick pre-round putts before the first time out with it, I could tell the Karsten TR Anser 2 model fit me and more importantly fit my eye. My two most often reoccurring faults (at least as far as putting is concerned) are lining up a little left of the target line and a slight loop on the backswing. I still lined the Karsten up left sometimes but usually was able to see that I was doing and make a correction. 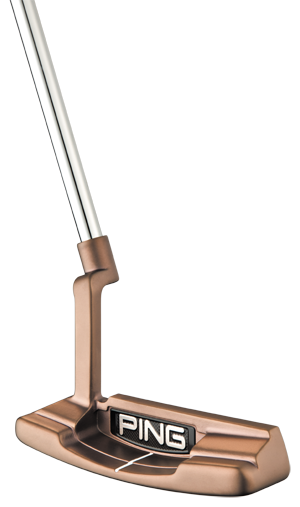 Additionally the Anser 2 is weighted for a slight arc back and through (medium toe hang) and this helped with my occasional loopiness. TR stands for True Roll which comes from the face having grooves of variable depth to improve the impact if you should hit the ball off center. The feel is soft especially with a urethane cover ball and dialing-in the proper distance for example on downhill putts was not a problem. 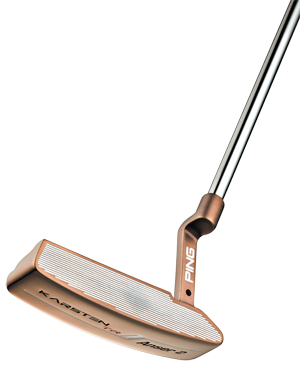 When first looking at the copper finish of the Karsten TR I wondered if it would be a problem, i.e. reflective, in bright sunshine but it wasn’t and in fact provided a helpful contrast to the single sight line. 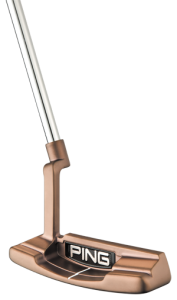 In addition to the Anser 2 shape, which is also available with an adjustable shaft, other models of the TR include familiar Anser 5, B60, Pal and Zing. 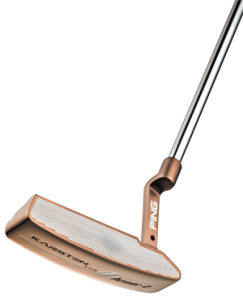 The Karsten TR Anser 2 is an extremely good putter and if the new season means a new putter is in the cards, I recommend you try it.